History repeated itself this afternoon at East End Park as the struggling Pars beat Rangers 3-2 in an amazing 3rd Round Scottish Cup tie. 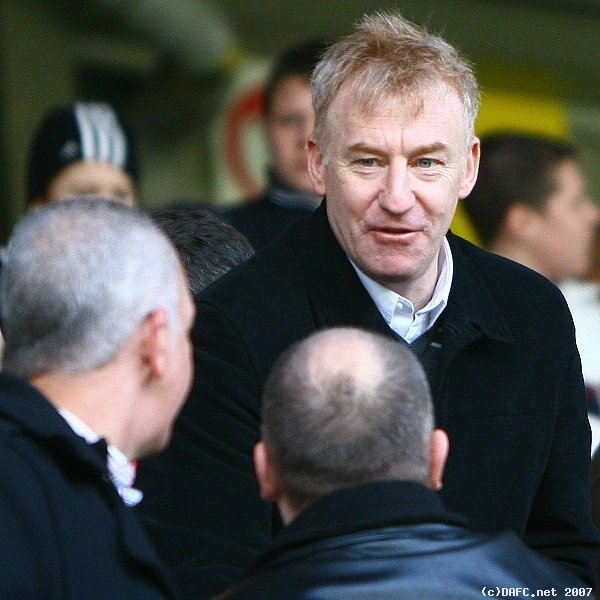 It was on the 20 February 1988 when the Pars beat Rangers 2-0 to dump Graeme Souness`s side out of the cup and history certainly repeated itself today as the unfancied Pars side took an unbelievable 3-0 just after half time which was entirely deserved. There was no doubt the home fans we very pessimistic about their teams chances evidenced by the embarrassingly empty home stands. It was a very poor home support which gave the atmosphere akin to a home match for the visitors. The Pars injury problesn are still causing havoc and today was no different. Greg Shields, Mark Burchill and Gary Mason all out injured or ill. Making his Pars debut was loan signing James O` Brien who in came in on the right side of midfield. The Pars team lined up with McKenzie in goals, Greg Ross at right back, Phil McGuire and Scott Wilson (captain for the day) and Scott Morrison at left back. In midfield, O`Brien, Stephen Simmons, Darren Young and Owen Morrison. Jim Hamilton and Stevie Crawford led the attack. There was little action of note in the first 5 minutes as both teams felt their way into the game but it was the Pars who were doing the attacking. James O`Brien was to the fore in those early stages as was Owen Morrison. O`Brien hit a cross from a free kick on the left which McGregor held easily. Stephen Simmons was also having a cracking game in the early stages and almost took McGregor by surprise in 12 minutes with a shot from 25 yard out which McGregor was slow in getting down to. Rangers had their first effort at goal in 13 minutes when a Svensson header was well saved by McKenzie. There was a moment of panic in the Pars 6 yard area as Rangers put over a cross from the left by Ian Murray that almost found Boyd amid claims from Rangers that Morrison had handled. Then sheer delight as the Pars took the lead and at last scored first in a match as Jim Hamilton got on the end of a Morrison cross which dropped over the Rangers defence. Hamilton lashed the ball past McGregor. There was then the familiar sight of Novo diving in the Pars penalty area and, rightly, being booked by referee Ian Brines. The Pars almost scored a second goal in 25 minutes as panic was caused in the Rangers area from a Pars corner which was just cleared pretty unconvincingly. 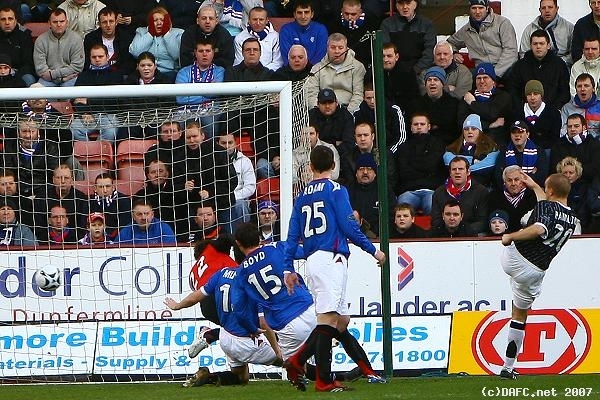 Jim Hamilton opens the scoring for the Pars. The Pars then extended their lead which was fully deserved on the balance of play in 29 minutes as Stephen Simmons put the ball high into the net after his initial shot was blocked and, again, the Rangers pitiful efforts at clearing their lines failed. Rangers made an early change with Burke coming on in place of Rodriguez. 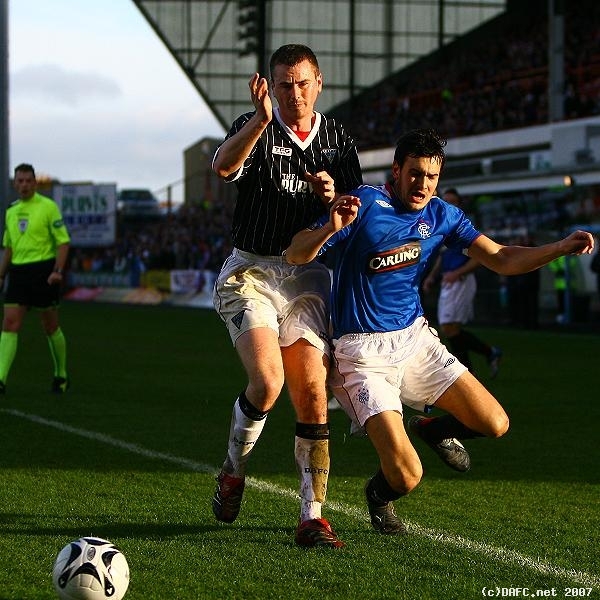 The tricky winger was to prove a handful for the Pars defence later in the game. Boyd was booked for a cynical foul in 35 minutes. Roddy McKenzie had to come out to the edge of his area to stop Novo in 36 minutes making a very good stop. Adam was then booked for a bad foul on Hamilton. 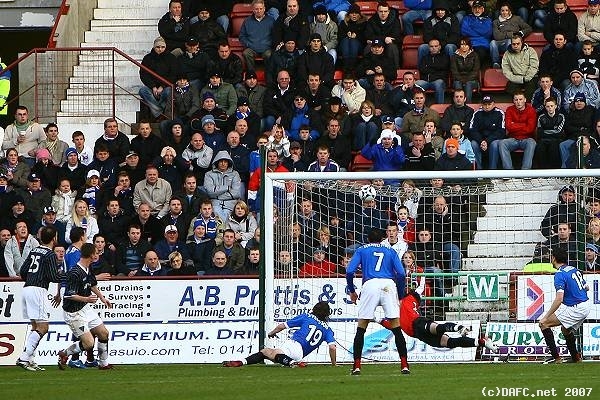 Rangers won a doubtful corner in 41 minutes with a header flashing wide past McKenzie`s right hand post. Half time 2-0. No doubt Pars fans at the game, or at home watching on TV, would be thinking that they were about to witness a Rangers onslaught. Noone could have expected the Pars to increase their lead to 3-0 but that is exactly what they did. A corner from the right was crossed into the danger area by Scott Morrison and Phil McGuire rose majestically to crash his header into the net 3-0!!!! Darren Young who was back playing in his more familiar role in midfield (and playing like his old self) picked up a yellow card for a foul on Burke. It could hardly get better for Dunfermline but Crawford and Hamilton linked well but they managed to waste the chance for 4-0. That miss may have been something to regret as Rangers pulled a goal back with Boyd hitting a low cut back from the right past McKenzie in 54 minutes. That was the signal for th eexpected Rangers onlsaught to happen yet a minute later Crawford had a gilt chance to make it 4-1 when he cut in from the left, as he does, but his low shot was too direct at McGregor who easily saved. In 62 minutes again another Pars chance as Morrison also cut in but his shot was side footed trying to curl into the far corner but without enough pace on the shot. Rangers made another change with Buffel replacing Adam in 63 minutes. In 66 minutes the Pars also made a change with a welcome return for Calum Woods on for Morrison who got a deserved ovation from the home fans.